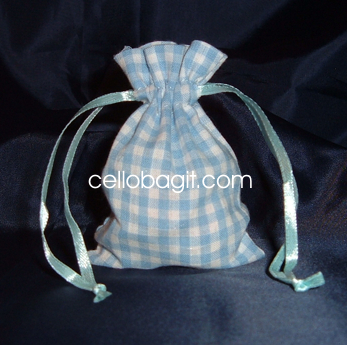 3x4 Cotton Gingham Wedding Favor Gift Bags/Pouches - Light Blue (10 Bags) •	Size: 3"x4" Bags (10) •	Material: Cotton Gingham with satin drawstring •	Great storage items for precious jewelry or wedding favors •	Use your imagination and give it in a bag! •	* Color as specified in the title & as pictured ---------------------------------------------------------------------------- These classics have been around for a while representing a traditional pattern. Made of quality cotton fabric. Yet another wonderful product at a very competitive price.. Use them as favor bags, jewelry bags, baby showers or small gift items.